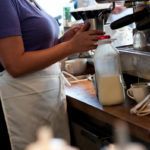 I met Joe Miller early one morning at Northside Social coffee shop, which offers Trickling Springs milk. They use it to make coffee drinks, ice cream and sell it by the bottle to customers. That locale caters to a high-end crowd in North Arlington’s Clarendon neighborhood, folks who will pay a bit more for local milk. As we chatted, Miller revealed plenty of reasons about why Trickling Springs’ business is going gangbusters. Trickling Springs began in 2001 with an idea by Myron Miller (Joe’s father who has since left the business) and his business partner, Gerald Byers. Joe, the company’s main marketing and sales contact, has been with the company for a total of about three years. “We buy local farmers’ milk, pay premium price for it and market it,” he explained. 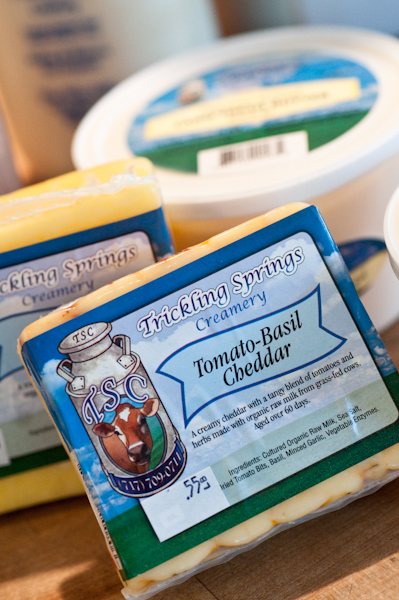 Trickling Springs also has product lines for butter, ice cream, cheese and other products. The milk is the basis of the company, and Miller credits the quality of the local farmers’ products for the fact that, even during a deep economic recession, Trickling Spring’s business has doubled in the past two years. Always drink regional milk to get the best quality, he said. “Milk is a perishable product that should be delivered as fresh as possible. Our milk goes through minimal processing. It’s nutrient-rich and contains natural enzymes. When the consumer gets it, the milk is less than a week old.” By comparison, milk you buy at the grocery store might be two weeks old when purchased. Plus, Miller claimed, their milk from local farmers is better because of how they care for the cows. “Cows are natural foragers,” he noted. Trickling Springs cows roam the pasture and are grass-fed, which is easy on their digestive system. Miller said this makes their milk a good source of conjugated linoleic acid (CLA), an antioxidant and polyunsaturated fatty acid (PUFA) or “good fat.” The jury is still out about the health benefits of CLA; more research is needed. All of these factors provide a higher protein content for Trickling Springs milk, and aside from the nutritional benefits, more protein makes for thicker foam in your espresso drink. Trickling Springs offers two lines of products: certified organic and natural. “The standards for our farmers are higher than organic standards set by USDA,” Miller explained. For the organic line, a third-party certifier – Pennsylvania Certified Organic – ensures that U.S. Department of Agriculture National Organic Program standards are being met or exceeded on each farm. The line of “natural” products follows the aforementioned organic standards without the actual certification. Usually, farmers are on their way to certification, Miller said, filling out the paperwork and jumping through the regulatory hoops required by the process. So why the glass bottles? Reusable glass bottles give the milk a “crisper, fresher taste,” Miller noted. They’re also environmentally friendly, a real plus for many Washingtonians who place a premium on practices that promote a green lifestyle. According to Miller, one glass bottle saves 40 plastic jugs. Nutrition facts cannot be listed on the reusable glass bottles, but you can find them on the website or by calling the company. Here’s how it works: you pay a $2 deposit for the bottle when you purchase your first gallon/half gallon/pint/quart of milk or cream. If you get a ½ gallon of 2% organic milk, it’ll likely run you $4.49-5.49 on top of the $2 deposit. The natural milk runs from $3.79 to $4.29. The bottle is washed, sanitized, dried and filled by Trickling Springs. Most places that sell Trickling Springs can refill, but check with them before purchasing. In the Washington area, you can purchase milk and other products direct from the company or find them in Arlington’s Harry’s Tap Room, Northside Social, a number of area farmers markets, the Alexandria MOM’s Organic Market, Let’s Meat on the Avenue in Del Ray and select Maryland and Pennsylvania Whole Foods markets. Check out this clickable map of locations that sell Trickling Springs. 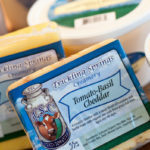 Trickling Springs also uses their milk to produce butter and ice cream. The butter contains 91-93 percent butterfat. More butterfat means it’s creamier and – you got it – tastier. Store brand butters contain about 80 percent butterfat by comparison, Miller said. I had to ask about a curious phenomenon I’ve heard food enthusiasts discuss lately. And that is: Do you store your butter in the refrigerator or cupboard? Store butter in the cupboard? Seriously? 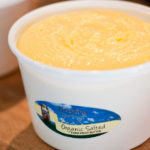 Miller said it’s true, the butter will keep in the refrigerator for three months, and depending on the heat and humidity in the house, butter can last outside of the fridge for about a month. There’s less buttermilk – it’s displaced by the increased amount of butterfat – in Trickling Springs butter, and that means a longer shelf life. Interesting…but I’ll stick to storing butter in the fridge all the same. The higher cream content also improves the texture and taste of the butter, Miller claimed. So I used the unsalted butter to make a loaf of challah and Alton Brown’s decadent cocoa brownies. Trickling Springs butter made two excellent recipes even butter. I mean, better. Interacting with and listening to consumers is a big part of Miller’s job and the creamery’s business. Active on Facebook and Twitter, Miller is tasked with “opening up channels of communications with consumers. We answer questions. We’ve ramped up in-store demonstrations.” There are usually one or two every weekend in the sales area, which goes as far south as Fredericksburg, Virginia, north through D.C., Baltimore, Harrisburg, and east to Philadelphia. Of course, I’ve saved the best part for last. Info about ice cream. First, there’s news. Miller didn’t go into the details, but he revealed that Trickling Springs is “working on a few things with our ice cream that could be big.” Self-serve ice cream dispensers on every street corner? Daily express bus service between D.C. and Trickling Springs’ shop in Chambersburg? A chocolate-peanut butter ice cream so good that I’ll have an out-of-body experience every time I enjoy it? Perhaps even my wildest dreams cannot predict what Trickling Springs has planned. “Our goal in ice cream is to offer a stellar product.” So I guess you could call it super-premium ice cream. Folks in Chambersburg seem to think so: at the local Ice cream Scoop Off, out of nine competitors who offered more than 40 flavors, Trickling Springs’ Black Raspberry Ice Cream won first place. Miller handed me a couple of containers of ice cream – root beer and the award-winning black raspberry. I decided to do a blind taste test with Every Food Fits fans to get their reactions. This blog is all about sharing the wealth. And the toughest critic of all, my husband Luis, tasted the black raspberry and said, “It’s hard to make fruit-flavored ice cream really well, and somehow they’ve done it.” An ice cream connoisseur who has been known to pile more than a couple of scoops into his dish, Luis also noted that he could eat less of the extra-creamy frozen treat and be just as satisfied. A half gallon goes a long way. You’ll find Trickling Springs ice cream in locally owned stores such as Mom’s and On the Gourmet in Vienna, Virginia, but if you don’t see it, be sure to ask. Not only will Trickling Springs accept special orders – no matter how big or small – but if store owners get enough requests, they’ll likely stock it on a regular basis. Do you use Trickling Springs products? Which ones are your favorites? What do you like or dislike about them? DISCLAIMER: I received a tub of butter and two containers of ice cream from Trickling Springs Creamery. Very nice Stacey. I’m a big TS fan myself. Their cream is stupidly good. The ice cream is to die for. Unbelievable. 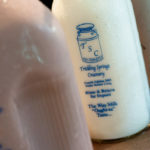 Trickling Springs Creamery has THE best chocolate milk EVAR. And their chocolate ice cream is like a more solid version of their chocolate milk. My husband can snarf both down in no time flat. I’m personally satisfied with much 2-3 Tablespoons full of the chocolate ice cream, but my husband has polished off a half gallon in less time than it took for me to eat a pint. Their butter is also outrageously good, and if you can get it when it’s a super deep yellow (almost orange-y), melt it over popcorn because it will taste just like movie theater popcorn before they switched to the fake stuff. To tell you how good their ice cream is? I got a quart of it at a local demo. There are no local places to buy it, so my husband and I took the 2 hour drive to their Chambersburg retail store and stocked up. Looking at the nearly empty chocolate carton, I think we’re due for another trip soon. My grandmother, my mother and now me always have had/has a stick of butter in the butter dish in the cabinet. I thought it was common practice for the longest time until my Mother-in-law and Sister-in-law were in shock when they learned of my wayward ways. We are HUGE fans of Trickling Springs products in our house. We are lucky enough to live fairly nearby and it’s the only dairy we use. Their milk, half and half, butter, and cheese are wonderful and their ice cream…. well, it’s just about beyond description. Our favorite: Black Forest!! everyfoodfits.com » I Scream, You Scream…for Sweet Cherry Sorbet with Lemon Basil!